You can read more and download from Janusz' blog. 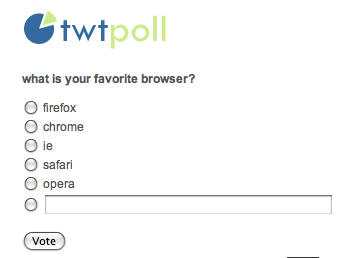 Bret Feddern has created a plugin to embed a twtpoll chart in your posts or pages. You can install it by entering the address http://www.bricecheddarn.com/mango/twtpoll-v0.9.zip into the download URL input in your administration > Plugins page. Read more at Bret's blog. Pritesh Patel has created a plugin that allows your readers to share your blog post using AddThis buttons. You can read more and download from Pritesh's blog. Want to promote Scotch on the Rocks? Install this plugin! Guust Nieuwenhuis has created a plugin to add a Scotch on the Rocks badge to your blog sidebar. Pritesh Patel has created a plugin that allows your blog's search to be added to the browser's search bar. It works in Internet Explorer 7 and above and Mozilla. You can read more and download from Pritesh's blog. Paul Klinkenberg has created a plugin that counts views of posts. It also outputs the count to the post footer. You can read more and download from Paul's blog. Mango Blog had logs to output information about failing plugins. These logs were publicly available, and some users pointed out that it may help hackers find out information about the blog install. They were mostly an aid to plugin developers (the logs only included information when plugins failed). To be honest, the logs where kind of put together rather quickly, so I decided to revamp the way they work. The logging mechanism is now much more flexible, allowing you to add your own loggers and allowing plugins to add custom loggers and logs. I've written some documentation on how to use it, so if you are interested, you can read more there. In addition, all logs are also stored in the database and no publicly accessible file is written unless you set up a new logger for that. I haven't added the log management to the administration, but that will come soon. In the meantime, you can use Adam Tuttle's LogViewer plugin, which has been updated to work with the new logs.